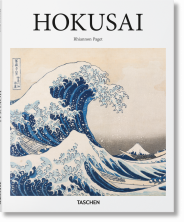 From verdant panoramas to decadent pleasure quarters: Utagawa Hiroshige’s final masterpiece, One Hundred Famous Views of Edo, is a woodblock journey through 19th-century Tokyo and a jewel in the ukiyo-e tradition. 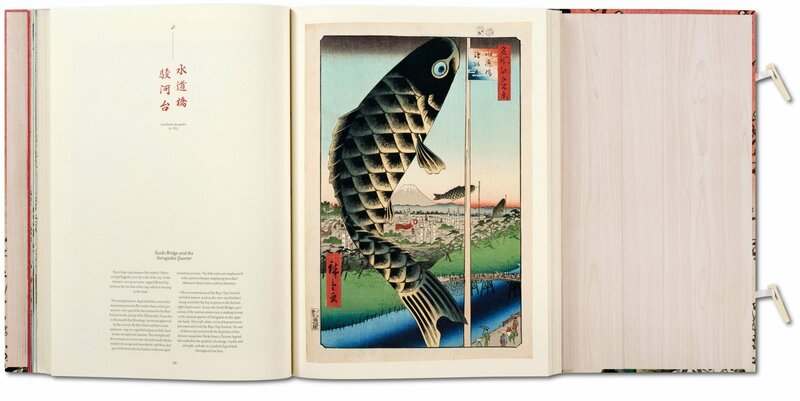 This reprint is bound in the traditional Japanese fashion and reproduces one of the finest complete original sets belonging to the Ota Memorial Museum of Art in Tokyo. 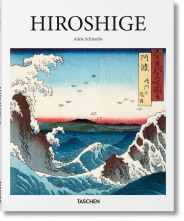 Literally meaning “pictures of the floating world,” ukiyo-e refers to the famous Japanese woodblock print genre that originated in the 17th century and is practically synonymous with the Western world’s visual characterization of Japan. 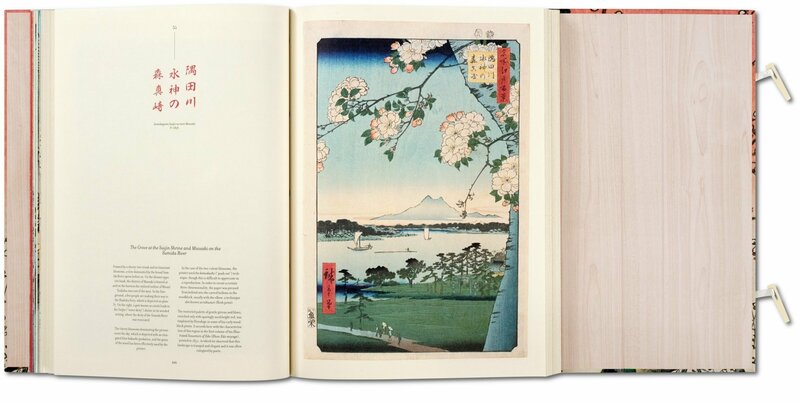 Because they could be mass produced, ukiyo-e works were often used as designs for fans, New Year’s greeting cards, single prints, and book illustrations, and traditionally they depicted city life, entertainment, beautiful women, kabuki actors, and landscapes. 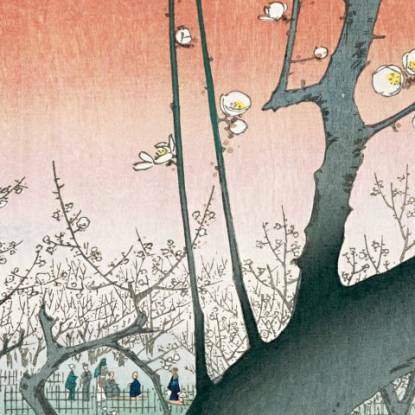 The influence of ukiyo-e in Europe and the United States, often referred to as Japonisme, can be seen in everything from impressionist painting to today’s manga and anime illustration. 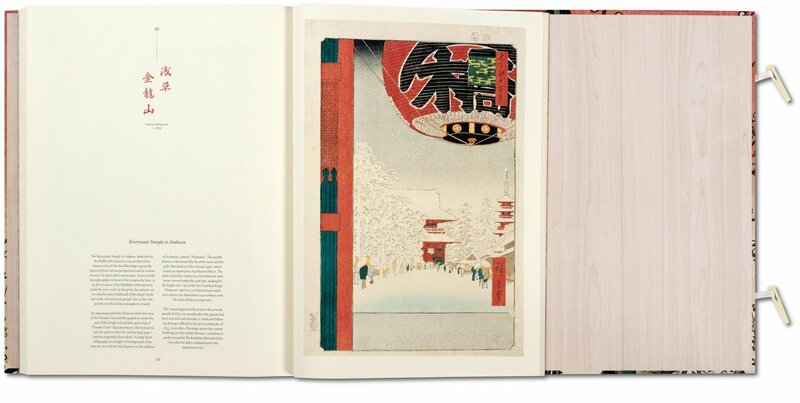 This reprint is made from one of the finest complete original sets of woodblock prints belonging to the Ota Memorial Museum of Art in Tokyo. 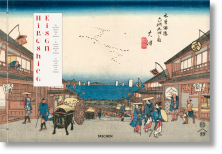 Hiroshige (1797–1858) was one of the last great artists in the ukiyo-e tradition. Though he captured a variety of subjects, his greatest talent was in creating landscapes of his native Edo (modern-day Tokyo) and his final masterpiece was a series known as “One Hundred Famous Views of Edo” (1856–1858). This resplendent complete reprint pairs each of the 120 large-scale illustrations with a description, allowing readers to plunge themselves into Hiroshige’s beautifully vibrant landscapes. "... this is a knockout. The binding itself is a pleasure: from the toggles to the odd, folded pages. 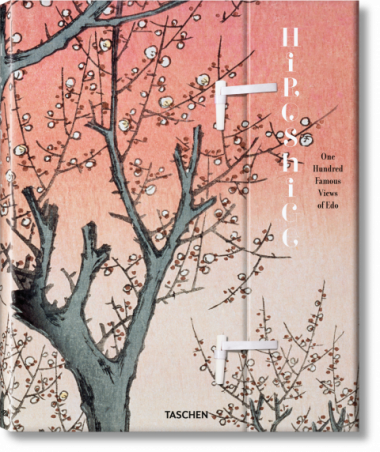 Inside is the wonderful portrait of a lost city... the wonderfully graphic and affectionate scenes by Utagawa Hiroshige range from day and night, from summer to winter, each explained in succinct text. "